BARRELASSIN': EDDIE VAN HALEN WAS MY VALENTINE'S DAY PRESENT! NOT TOO SHABBY! EDDIE VAN HALEN WAS MY VALENTINE'S DAY PRESENT! NOT TOO SHABBY! WHO GETS THE BEST VALENTINES DAY HUSBAND AWARD EVER? I think mine! For driving 7 hours, a day early on the chance that I could see Eddie Van Halen get out of a car or something. Guess he was as surprised as I was!!! Okay- full story. My phone blew up and I tried my best to document every moment for myself on that darned phone! 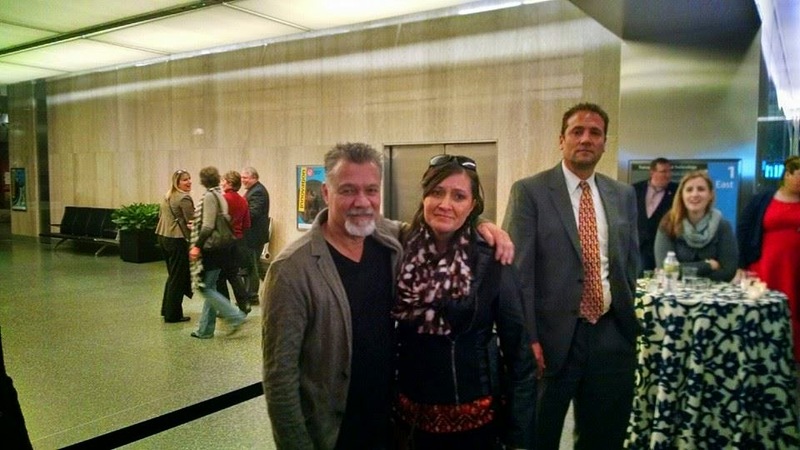 I Found out Eddie Van Halen was going to be speaking to a limited number of people at The National Museum of American History in DC on Feb. 12-2015. My Barrelassin' son, Timmy, is at Tech School an hour away from here so I planned our weekend visit one day early so we could at least go to the museum on the same day as Eddie. Reservations were free, but were gone in 3 minutes. Who cares? I can try it. I was wait listed. And I wait listed Jay and all my friends, mom and sister, too, just in case. Barrelassin' Jay said I was crazy. He's right, I am. We went to the museum and were told there was no need for me to wait, there was no way anyone wait listed would be let in. I hatched a plan. I told Jay we'd still stay at the museum, like we planned to do anyway, and when they were about to close at 5:30 (he was speaking at 6:30) we'd go hang around the area until they made us leave, hoping to catch a glimpse of him coming or going. Even people with reservations only had a reservation to stand in line- no seat guarantees. So we were hanging out on a bench pretending we belonged there since it was after 5:30 and nobody had kicked us out yet. I guess they weren't making anyone leave anyway. Some guy comes walking by to the restroom. He asks if we're going in. I explain we're wait listed and were not likely to get in. He reaches in his inside coat pocket and hands me his guest pass. He had reservations and it was extra guest pass. I KNOW!!! RIGHT?! He said he only had one, but we could have it. Naturally Jay was gonna stay outside so I would have hope of seeing Ed, my lifelong hero. But I told him to stand in line with me. They came down the line with the opened seat wrists bands and I explained to such a nice lady that I had a guest pass, but my husband was wait listed. She said he was the only one inside the building on the wait list. About 10 people ahead of us they stopped the line and apologized to everyone because they were full. She explained that we were all welcome to hang out and attend the ceremony afterwards and have a drink and food and meet Ed. I nearly died lol. She says they'll bring special armbands out to us. All of a sudden they come back and start giving armbands and letting a few more in at a time. We get to the NICE lady and I ask about Jay again, she says "I think we're just gonna go ahead and let everyone else in." (The 4 people behind us were staff and 2 of them had already let us in front of them for no reason.) They check my "friend's name" who gave me the guest pass and I'm good to go. One lady says I can go but Jay has to stay out. NICE lady says we're letting him in. They get into an argument in front of us. NICE lady is shoving us saying "just go on." Other lady is saying "we're not letting wait listed in!!" NICE lady says to her "SO AND SO IS HOUSE! AND HE'S GOING IN!!" (Not revealing her name.) Thank Heavens for whoever SO AND SO is! Then, we freaked out and froze our butts off and couldn't move our fingers by the time we walked/ran to the metro station and found our way back to our hotel shuttle. We hadn't eaten since 6:30 a.m. so we ate- and now I'm going to bed. Best Valentine's Day early start weekend EVER! As I ran across the busy street on the phone, I told my bff on the phone as I ran across the street- "If I die in this crosswalk, it's because I posted earlier that life is complete and I'm jinxed. The truth is, I told my husband, I went to bed that night feeling so at peace. Like, it had been my biggest dream in the works for over 30 years. Now what? Nothing. And that's fine. I mean, I have things I want to do and places I want to go, but that was literally my biggest dream. And now I've done it. I honestly feel relieved that it finally happened. Obviously I would love to do it again, and probably say something more meaningful than "I've waited my whole life for this" and "I've got a Van Halen tattoo" to him- but it's finally complete. I can't think of anything else that I can dream bigger at this point. I felt so honored to be in the same room with the Van Halen brothers and Ed's son, Wolf, other than in the concert halls, obviously.